This instant messaging is corporate oriented (enterprise), with local networks (lan) or internet for effective intra-office communication. Server is php/mysql (opensource), make easy for the administrator to choise all options, for display, contact manage, lock and more possible to force or not user to use password, limit (or not) maximum simultaneous users, online users, contacts numbers and more server can be public or locked by password. Intramessenger is autonomous, but authentication (login + password) possible by from another existing database (phpbb, vbulletin, phorum, joomla, phpnuke, dotproject, egroupware, ovidentia, dolibarr, achievo, smf, taskfreak, ip-board and more) can display local time zone, country flag, and using language. Client compatible windows and linux (with wine). File sharing/publishing and file exchanging. Can download setup, or just zip (no install) to direct use on usb key. Msi install available (for domain/ldap). Server screenshots : http://www. Intramessenger. 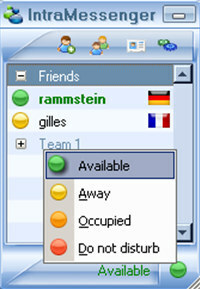 Net/images/intramessenger_1_en. Png? Http://www. Intramessenger. Net/images/intramessenger_2_en. Png? Http://www. Intramessenger. Net/images/intramessenger_3_en. Png? Http://www. Intramessenger. Net/images/intramessenger_4_en. Png? Http://www. Intramessenger. Net/images/intramessenger_5_en. Png? To see a online flash demonstration how to use : http://www. IntraMessenger is a communications program that works under windows xp, windows vista and windows 7. It is Free so you can download it and share it with your friends. Estimated download time for IntraMessenger on a common adsl connection is less than a minute. Version 1.31A was released two thousand thirty two days ago by THeUDS. Click the green download button to download it now.